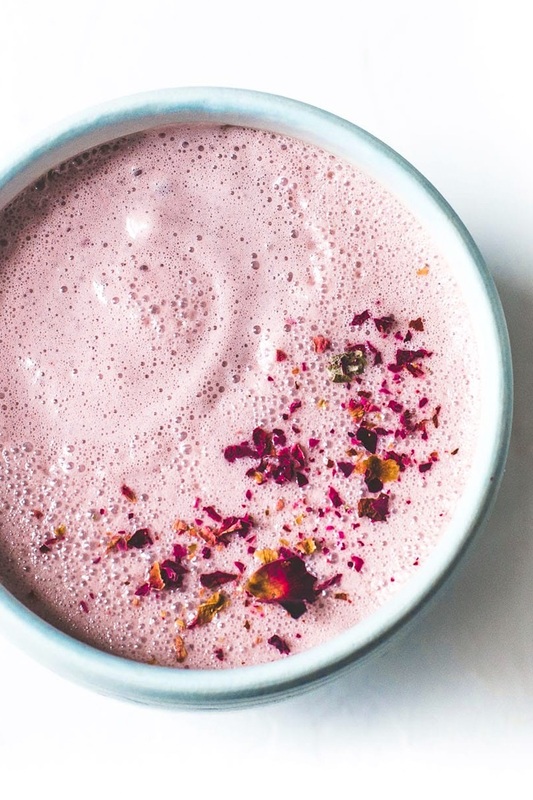 This cherry almond milk is a nourishing creamy drink, and the perfect warm sip to help you get a restful sleep. 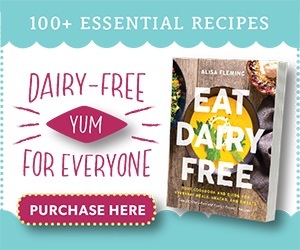 Instead of dairy milk, it’s made with dairy-free milk beverage and tart cherry juice, a natural food source of melatonin. Melatonin is a well-known sleep-regulating hormone. And new research from the American Journal of Therapeutics shows that insomniacs who drank U.S.-grown Montmorency tart cherry juice for two weeks improved their sleep efficiency and extended sleep time by 84 minutes. The study participants drank about 1 cup of tart cherry juice twice per day. This cherry almond milk contains half a cup of cherry juice, but it’s also spiked with ashwaganda root. Ashwaganda has been shown to help lower cortisone levels and reduce stress and anxiety, among other benefits. 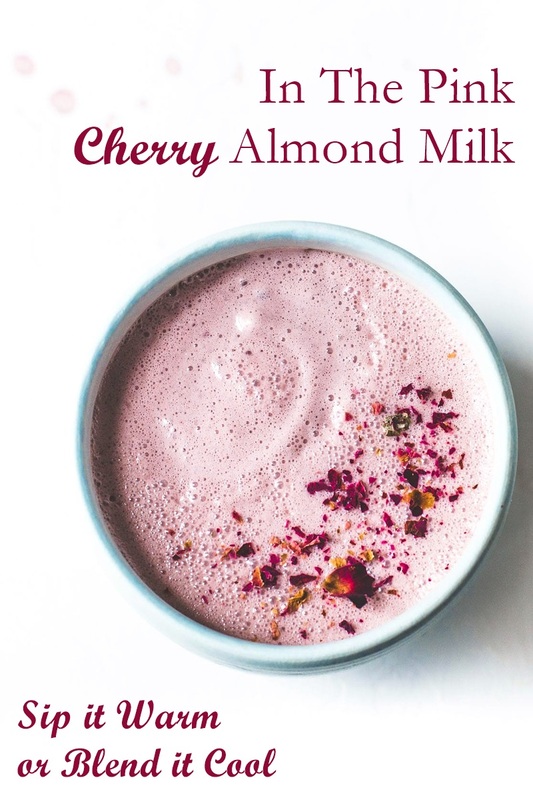 This cherry almond milk recipe with photos was shared with us by ChooseCherries.com, but both were created by Amanda of Heartbeet Kitchen. 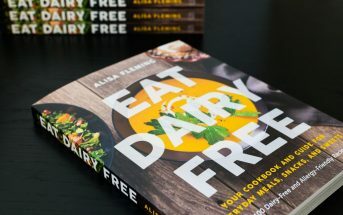 By ingredients, this recipe is dairy-free / non-dairy, egg-free, gluten-free, grain-free, peanut-free, soy-free, optionally vegan, plant-based, and vegetarian. 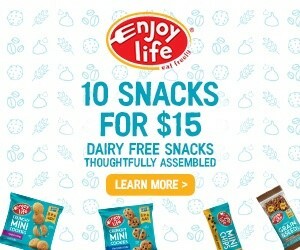 It’s also paleo-friendly! 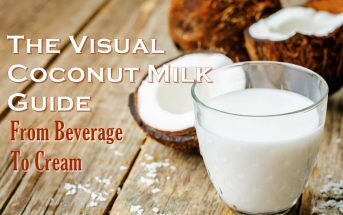 For a nut-free drink, substitute your favorite allergen-safe milk beverage. This creamy beverage is sweet, tart, and very nourishing. The tart cherry juice helps to promote restful sleep, and the ashwaganda can help you wind down. Pour the milk beverage and cherry juice in a small saucepan and place it over medium heat. Cook, while whisking, for a few minutes, or until very warm or hot. But do not bring it to a boil. Remove the pan from the heat and whisk in the honey and ashwaganda. Or, for a frothier beverage, pour the cherry almond milk into your blender, add the honey and ashwaganda, and blend to combine. 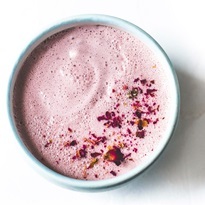 Pour the warm cherry almond milk into a mug and optionally top with rose petals to serve. Cold Cherry Almond Milk Option: Place the almond milk beverage, cherry juice, maple syrup (honey can be used, but it doesn't dissolve well in cold liquids), and ashwaganda in your blender. Blend until well combined. If an even cooler beverage is desired, you can blend in some crushed ice. Beautiful color! We love anything cherry and to find something so healthy is a real bonus. Does the ashwaganda powder add a flavor or is it more of a nutritional boost? I’ve not heard of it before. It’s for a nutritional boost. The herb itself doesn’t taste good, but in a small amount like this, the other flavors mask it. 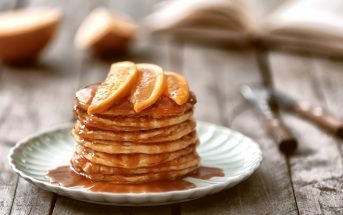 I love its benefits and even its simple recipes. This looks so refreshing and amazing!! I love how frothy and beautiful it looks. DEFINITELY going to have to make this for my family, they would love it! So pretty and the perfect drink to sip before bed! I need to pick up more cherry juice so I can whip up this beauty. This is so gorgeous! I’ve been really interested in all things edible-flower lately. Luckily I have rose in my cabinet already! 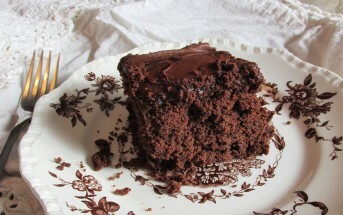 Looks so nourishing and delicious! What a great way to end the day! This is the perfect color for Spring and Easter! I have to try it cold and warm!